Ironbark’s focus on developing industry specific ERP software systems has led to a product portfolio that is not only diverse in nature, but one that excels in both general function modules such as payroll and financials as well as industry specific modules that offer each industry the very best software tools available. Ironbark’s devotion to ongoing research and development ensures their software offers the very best technology available across all business industries. Along with their devotion to R&D, Ironbark also have the flexibility to customise each of their industry specific systems and modules to the unique requirements of individual customers. 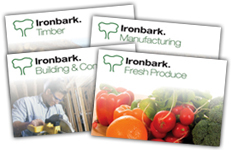 Ironbark pride themselves on delivering custom built systems to maximise their customers business.